Deforestation and forest degradation have long been important concerns for forest management as they harm biodiversity, contribute to climate change and increase poverty in developing countries. The problem is exacerbated where in many cases illegal forest clearance activities are seen in a number of developing countries.This goes against regulations and laws and disregards conservation and livelihood values of forests. Therefore, integrating measures to tackle not only the challenges of illegality (through forest and market reforms) but also those related to sustainable use of resources remains critical for environmental and social aims. Interventions which reduce land and forest degradation are crucial to ensure resilience by poor communities, including indigenous groups dependent on natural resources. We excel at programmes designed to improve forest governance for improved management of forests and increased livelihoods to reduce poverty and climate change.Our work is focused on programmes that combat deforestation and illegal logging of timber where we provide expertise in monitoring, evaluation and learning but also in some thematic areas which are stated below. We have extensive experience in providing focused support to development agencies, policy makers, private sector, and civil society organisations in forest governance and firmly believe that forest governance and climate change initiatives need to work together in reforms for sustainable use of natural resources and tackle poverty. Forest Governance, Markets and Climate Programme (FGMC) is a £250 million, 10 year programme, aimed to ensure that FGMC activities are on track relative to the milestones set out in the programme logical framework and are contributing effectively to the outputs and the outcome in the area of International trade in timber and other commodities, particularly agricultural commodity chains, and related controls and standards; Forest sector policy and legislative reform; Environmental and social issues in the forest sector, including those related to tenure rights, gender, poverty and livelihoods, and forests and climate change; International development and theory of change, and appropriate monitoring techniques to assess programme implementation. We undertook reviews of secondary information sources, including programme documents, country and regional strategy papers, country-level documentation and research reports, European Council and European Commission statements and other deliberations. In addition, conducted interviews with DFID and other government officials who have been engaged with the programme, representatives from the private sector and civil society affected by the programme; facilitated annual stakeholder FGMC meeting and conducted on-site visits to evaluate activities being undertaken. FERN is a Non-Governmental Organisation (NGO) working on rights and the issues that affect forest people such as trade, investment and climate change. The overall goal of the programme is to improve forest management by strengthening community tenure rights and improving forest governance – specifically within the framework of the European Union Forest Law Enforcement, Governance and Trade (EU FLEGT) process – through legal, institutional and policy reform. As an Independent Monitor (IM), we guided the programme and providing insight into its effectiveness in delivering its results and outcomes using various M&E approaches/tools, such as ladders of change, results chain, theory of change , most significant change and appreciative inquiry. As part of the project, we are prepared annual reviews, developing M&E manual and providing training, and review of civil society platforms supported by FERN. The participatory mapping project in the Congo Basin, funded by DFID, aimed to promote recognition of communities' rights to access, control and use of forests in the legislative, political and strategic processes of three Congo Basin Countries (Central African Republic, Gabon and Congo-Brazzaville). 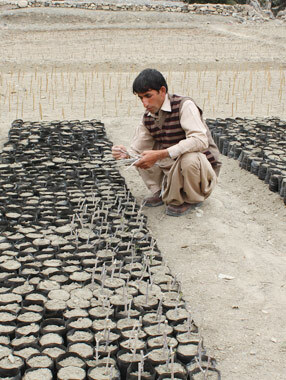 The purpose of the project is to ensure forest communities, Community Service Organisations (CSOs) and government staff in each of the three target countries, have the capacity and resources to accurately map community forest land tenure, land use and make use of the data thus compiled, in taking and influencing decisions related to forests and forest communities. As part of the project, we designed an evaluation framework, undertook an external evaluation and provided recommendations, which helped to shape second phase. In addition, we undertook extensive field work in respective countries for assessing the community forestry, community mapping of forest land tenure and the different legislative frameworks in Congo Basin countries in relation to community tenure rights.